You have already seen before that I got a wonderful gifts from my fiance what were Dior cosmetics. I never used mascara worth £25 before🙉. Let's see if it's worth spent so much money and how works compared to cheap? Dior reinvents volume with Diorshow Pump ’N’ Volume, a brand new squeezable mascara for a captivating fringe of XXL lashes. A revolutionary mascara with never seen before elastomeric packaging design. The squeeze of the supple mascara bottle enables a more dramatic loading of the brush that coats every surface of the lash for an ultra-volumising effect, just like Backstage at Dior. The ground-breaking Evercreamy formula™ gives instantly oversized yet clump-free volume in a single sweep. Proven results instantly after application of the mascara: +100% volume (Instrumental test on 16 women, usual applications vs bare lashes). I start about the package because I've never met such before. It is made of rubber to prevent drying out. To get the ideal amount you need to squeeze the flexible mascara tube OMG😮cool hehe, and it really works. I think it's very interesting and nice to see finally something new. The brush is big, comfortable and silicone. 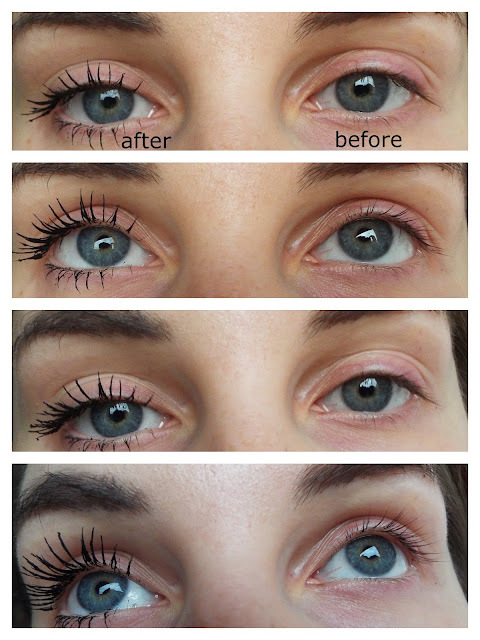 The mascara keeps up all day without crumbling and ,,panda '' effect. Gives the color of true black, doesn't fade. It just annoys me that it's hard to wash off so surely it is also waterproof. Is it worth the money?I think the effect does not differ so much in comparison to the cheaper mascaras. It is not a cosmetic that I couldn't live without, although I am very happy with it and if you have a free budget why not try. For me it gives a nice effect but judging yourself on the basis of pictures.